How do you tend to react to your fears and threats to your plans, responsibilities, needs and hopes? Anxiety? Or vigilance? Suppose there is a problem at work or in finding a job. How about coping with the increasingly scary reports about Fukushima? Do you become anxious and upset, maybe even panicky, or do you become vigilant like a well-disciplined ramrod infantry sentry—watchful, concerned, alert, ready, agile, but not upset or paralyzed with fear? Although the boundary between them is fuzzy, it is, in fact, thicker than a thin wire, which is a good thing, since trip-wire intense anxiety, which can clobber one’s emotional balance and decision making, would otherwise be hard to see coming and therefore harder to prevent and control. Remaining vigilant, rather than anxious, not only enables us to avoid anxiety by replacing it with better [self-]control, but also makes it possible to monitor ourselves and situations for signs of imminent or likely eruptions of anxiety’s worst forms—panic and paranoia. Anxiety about a job application, a delayed candidate placement, a cratered job market, a client’s demands or about almost anything else is very similar to depression: Unchecked, it tends to fuel or escalate into a feeling of helplessness and panic. Anxiety is also, despite any appearance to the contrary, demotivating, as the powerful emotions associated with it displace clear thinking and focused proactive coping behavior. Calmer vigilance, on the other hand, tends to lead to proactive action and volition—determined and adaptive exercise of will, rather than to emotional meltdown and helplessness. You had your job interview two weeks ago, but have heard nothing more from the company. The wait is killing you and you’re plagued with worry, self-doubt, fear of the competition, doubts about the sincerity or interest of the company, etc. The anxiety is sinking you and about to goad you into impulsive, reckless action, e.g., firing off an angry email. Instead of calmly monitoring the situation and planning your next move and its timing, you and your stomach churn—first with confusion and fear, then with anger and vengefulness. Oops!—You just crossed the line, tripped the wire and blown up your chances in a minefield of destructive anxiety. Vigilance, on the other hand—a state of heightened alert and focused attention, is quite the opposite. Vigilance is far more effective and healthy in the face of a crisis or concern than anxiety is, yet for all too many, anxiety ends up being the response of first resort, rather than last. Why? Why would anyone choose paralyzing or destructive anxiety over nimble, adaptive, cool-headed vigilance? On the employer side of work, why would any boss want his employees to be anxious rather than vigilant about anything, e.g., quality control, sexual harassment or meeting performance quotas? Although there may be exceptions, in general, on both the labor supply and demand sides, it makes sense to cultivate employee vigilance instead of anxiety. True, in some circumstances, terrifying employees can achieve employer objectives, e.g., threatening harsh penalties, including dismissal, if they attempt to unionize. In that instance, triggering employee vigilance might backfire, if it creates a cool-headed attitude and vigilance-based tactics to outmaneuver the boss. Nonetheless, when it comes to our own actions and emotions, clearly anxiety should be a last resort—especially given its propensity to evolve into panic, paranoia and very bad decision-making. About the only response that anxiety is better than is delusional denial. Staying on the right side of the divide between vigilance and anxiety is smart and crucial to every aspect and arena of life, not just in employee management and performance. Still within the domain of business, the distinction between vigilance and anxiety can also play a vital constructive role and serve as a tool in marketing. For example, in a recent conversation with a regional manager of a global company that produces home alarm devices, I stressed the importance of ensuring that scare-based marketing does not inadvertently make potential customers so anxious about the dangers that the alarms are designed to detect and report that they refuse to think about them and back off from purchasing—preferring instead to go into a state of denial and rationalization of inaction. That’s like painting such a horrific vision of a house on fire that the potential customer decides to move to a stone house instead of getting a smoke alarm. The manager’s reaction to our conversation: He has proposed to management that the vigilance-anxiety distinction be visibly incorporated into marketing and advertising. That’s a smart move. But that still leaves the question of why anyone would not, for themselves or for their customers, steer completely clear of triggering anxieties that will or are likely to defeat their objectives, unless, like a union-busting boss or a Hollywood gash-and-slash horror movie, the objective is, indeed, to create anxiety or even terror, e.g., as the movie audience gets to play “victim”, get an adrenaline rush or scuttle up the aisle, mid-movie, in a comfort-candy-counter crush. 1. The lack of alternatives and the urgency of demand: For example, selling bottled water at outrageous prices after a natural disaster is easier when the survivors are anxious, impatient and desperate. 2. Whether the anxiety is “automatic anxiety”, rather than “signal anxiety”: This is the distinction between a tornado forecast as a “signal” of an approaching tornado and the trauma of seeing a funnel a half-mile wide less than 200 yards away. In a state of instinctive, automatic and intense anxiety typically triggered when it’s too late for vigilance, decisions are more readily made on the basis of overwhelming fear. At that point, “services” offered, e.g., a ride in a truck or a place in a wine cellar—free or for fee—will be music to panicked ears. 3. Whether the product or service is offered as a precaution: In this instance, when the product or service is acquired as a precaution, the vigilance envelope should be pushed only as far as necessary to seal the deal, with great care taken not to trip an unpredictable, uncomfortable, disempowering high-anxiety or panic response. In precautionary vigilance-based marketing, the beauty and appeal of the sale is that it restores a sense of control to the client or customer, unlike anxiety-based marketing, which carries a real risk of backfiring and triggering denial, evasion or purchase of something else. This choice should be as easy to make as the choice between frustration and depression—frustration being like vigilance to the extent that it involves a greater willingness to try to cope, to fight back and make a proactive or even reactive effort than fetal-ball-curl-and-die depression ever does. 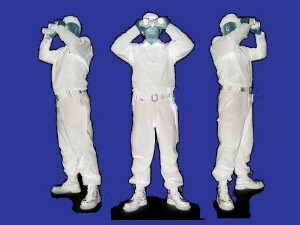 However, as indicated above, when a situation is perceived as having gone beyond the point at which it is too late for precautions, i.e., to the stage of automatic anxiety, panic is likely to flare, with all its attendant costs, anxiety may not only be the best option, but also the only option. Likewise, individuals predisposed to helplessness and catastrophizing are probably inherently likelier to resort to anxiety and victim-role play faster, since vigilance and helplessness are fundamentally incongruent. If a boss with an agenda knows that his employees have no alternatives to submission, that his sanctions are feared and that he must eliminate any employee sense of empowerment or control, the last thing he would ever do—as explained above—is encourage vigilance, whereas that should be the first employee response and the best. Recently, in light of the wildly conflicting reports about the dangers posed by looming arrival of the ocean-borne flow of Fukushima radiation in the Pacific Northwest and upcoming risky removal of tons of intensely radioactive rods from the Tepco Fukushima site—reports ranging from the reassuring to the utterly terrifying—I bought a radiation detector. A good one. When I discussed it with a friend here, she told me that I was stressing myself out, that the purchase was “neurotic”—which I understand to describe, as a minimum, anxiety-ridden self-defeating behavior, which mine clearly was not. I replied that, far from stressing myself out, I have [re]gained a measure of control over my life—right now and into the foreseeable future. Being vigilant, rather than anxious, I calmly investigated the issues and options, made a decision and achieved a kind of closure, however temporary—rather than become increasingly anxious about otherwise undetectable hazards. Upon receiving the device, I equally calmly took a number of readings, all at perfectly normal levels. My sleep, blood pressure, heartbeat, hobbies, digestion, dreams, breathing, energy and outlook—all remain characteristically unstressed, as far as I can tell. However, there is one stressor that my vigilance has triggered. Having to listen to somebody insist that I’m stressed out.